May connect with Branch 27. This Latta may be the grandfather of Thomas Moore Latta who served in the Revolutionary War as a captain and died in the Battle of Brandywine on Sept 11, 1777 near Chadd's Ford, PA. If this "Latta" grandfather was not the one who was killed at the Battle of Brandywine, then it would have been his maternal grandfather, the father of Martha Latta, whose maiden name is unknown. ______(1) Born _____Died 1818 in Wayne Township, Jefferson Co., OH; married Martha __________ (possibly "Moore"). In the Pittsburgh Gazette on May 6, 1815, "Latta's Tavern" in Wayne township, was listed as a gathering place by commissioners in the article. (See below) In the "Early Records of Jefferson County, OH 1788-1851" by Mary E. DiThomas, it listed letters remaining at the post office in Steubenville on July 25, 1807 - Thomas Latta. The book also stated that four Lattas born in Ohio in the 1820s settled in Grandview Township with Thomas Christy. Christy was a lieutenant in Captain Thomas Latta's Co. in 1812. The War of 1812 lists Capt. Thomas Latta's Co. from Jefferson County, Ohio, in the war. The 1817 taxes for Wayne township stated that Thomas Latta had 2 assessments in Jefferson County, and 1 tax assessment in Guernsey County. The "Western Herald," of Steubenville, OH on March 30, 1818 published an estate notice for the estate of Thomas Latta, late of Wayne Township, deceased. Martha Latta and Josiah Crawford, Administrators. Josiah Crawford is found in the 1820 census for Wayne Twp, with his wife, Margaret Clendonen Crawford, and several children. Martha Latta later married Thomas Marshall on May 23, 1820 in Jefferson County, Ohio. Thomas Hunt, pastor of Two Ridge and Richmond Presbyterian Churches, performed the ceremony. 3 THOMAS MOORE (3) b. in Jefferson Co., OH in 1799; d. at Marshall, Clark Co., IL on September 10, 1852. 30 ELIZA (3) b. abt. 1809; d. 1887 in Kansas; m. Henry H. Beckett on March 25, 1830 in Jefferson Co., OH by B. Mitchell, NDM. Henry H. Beckett was born in Fayette Co., PA in 1803. In the 1880 Census, Eliza is found living with her son, Thomas L. Beckett, in Olathe, Johnson County, Kansas. She is listed as a widow. John Beckett, 41, PA "idiotic"
Thomas J. (2) ____ (1). Born in Jefferson Co., Ohio in 1799; d. at Marshall, Clark Co., Ills. September 10, 1852; m. Catherine Myers, daughter of Jacob Myers, who came to America from near Strasburg, Alsace, France. She died at Marshall, Ills. September 10, 1851. Thomas lived at Paris, Stark Co., Ohio and went to Ills. in the fall of 1851. Thomas M. Latta was granted a tract of land in Illinois in 1852 shortly before his death. Thomas Latta is listed in the 1820 and 1830 Census at Brown, Stark County, Ohio. 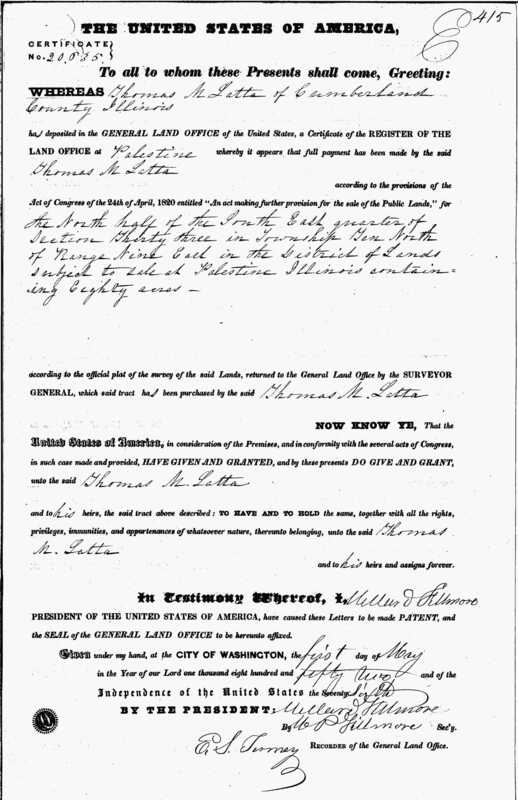 Thomas Moore Latta's death certificate states that he was born at Gettysburg, PA. Note the 1850 Census for Paris, Stark County, OH stated that he was born in Pennsylvania. If this is true, this branch would probably be related to Branch 27. Catherine Latta died within months of their trip to Illinois on September 9, 1851 of cholera, and Thomas died October 10, 1852. The children were appointed guardians by the court. 10 Unknown Female (4) twin daughters b. February 1837; d. At birth. 11 HERMAN HARRISON (4) b. at Paris, Stark Co., Ohio July 13, 1838; d. December 30, 1838. 4 THOMAS JEFFERSON (4) b. September 23, 1839 in Stark Co., OH. 5 JOHN WORLEY (4) b. Nov. 1, 1841. 6 ALBERT BELLAMY (4) b. March, 1844. Ills. October 4, 1867 . He was born at Cincinnati, Ohio Nov. 25, 1837 . Enlisted at Cincinnati as a private in co.1st. Reg. One Child, Jammie Born: Aug. 20, ???? . 13 MARY CATHERINE (4) b. December 25, 1848 at Paris, Ohio. Issue 51: Orphaned and Alone, by Sue Lattea Cox, V.P. Research - While looking into some history of Branch 37, I discovered that #3 Thomas Moore Latta lived in Stark County, Ohio. He was the son of Thomas J. Latta, who died in Wayne township, Jefferson County, Ohio, in 1818. The "Western Herald," a newspaper in Steubenville, Ohio, published on March 30, 1818, under their estate notices that Martha Latta and Josiah Crawford were administrators of the estate of Thomas Latta, late of Wayne township, deceased. Martha Latta would later marry Thomas Marshall on May 23, 1820 in Jefferson County, Ohio. They were married by Thomas Hunt, pastor of Two Ridge and Richmond Presbyterian Churches in Jefferson County. According to the death certificate of his son, John Worley Latta, Thomas Moore Latta was born about 1799 in Gettysburg, PA. Thomas Moore Latta is found in the 1820 and 1830 census at Brown, Stark County, Ohio, and in 1840 and 1850 he is found in Paris, Stark County, Ohio. Thomas Moore Latta married Catherine Myers, daughter of Jacob Myers, who came to America from France. The 1850 census lists Thomas, age 48, and Catherine, age 33, with five children, Thomas, age 11, John, age 9, Albrat (Albert), age 7, Olive, age 5, and Mary, age 2. In late April, 1851, the Latta family moved from Ohio to Cumberland County, Illinois. On September 10, 1851, their mother, Catherine Latta passed away. No cause of death is found, however a cholera epidemic had hit Cumberland County, Illinois during that time, and those effected by cholera perished within three to four days of contacting it. Thomas Moore Latta is left a widower with four young children. The following year, Thomas Moore Latta passed away also, leaving the four children orphaned in Cumberland County, Illinois, far away from family members who might take them in. Guardians were appointed to the children, and in a "History of Cumberland County," John Worley Latta noted that his family came to Illinois in April 1851, and located in Marshall in August. Colery broke out in the neighborhood. His mother died September 9 of the same year. His father died October 10, 1852. "A gardian was put over us children and he bound me out for 3 1/2 years. I ran off and west to Pittsfield, Pike Co. Was there when Douglas and Lincoln canvassed the state in 1858. I joined the army 28th of July 1861. Was in the Battle of Shilo and Corninth, Miss. April 6 & 7 at Corinth, Oct. 4 and 5th, 1862 was in the battle at Brices Cross road June 10, 1864." John Worley Latta's brother, Thomas Jefferson Latta, was an active school teacher before and after the Civil War. Thomas enlisted in the Civil War in 1861 and served as a Sergeant in Co. B, 2nd Regiment, Light Artillery. He was wounded in the Battle of Guntown. He was run over by a heavy artillery wagon and left lying on the battlefield until a comrade came along and picked him up. In the battle of Shiloh, he rode a little white pony 150 miles in the retreat under General Grant. The "History of Cumberland County" also stated that the brother's grandfather, was a Captain in the Revolutionary War and was killed in the Battle of Brandywine. It doesn't state whether this was their paternal or maternal grandfather. Their father, Thomas Moore Latta, was a Captain in the War of 1812. A history of Jefferson County, Ohio, shows Capt. Thomas Latta's Company from Jefferson County serving in the War of 1812. Could this link this family to Branch 27? 29 Joh. W. Latta 40 & ?? Latta, Jefferson, corporal, August 26, 1861, MO August 31, 1864 as Sergt. Latta, Thomas J., recruit, discharged August 31, 1864 as Sgt. Thomas (3) Thomas J. (2) ____ (1). Born September 23, 1839 in Stark Co., OH; d. January 12, 1925 in Greenup, Cumberland Co., IL. His death certificate stated that his father was Thomas Moore Latta, born at Gettysburg, PA, and that his mother was Catherine Myers, born in Alsace, France; m. Catherine Fogleman, on November 26, 1871. The "Cumberland Democrat" published on December 1, 1871, p. 3 that "Thomas J. Latta and Miss Catherine Fogleman, both of Sumpter Township, were married 20/26 Nov 1871 at the City Hotel by Rev. N. C. Green. Catherine is buried at Terre Haute, Ind. He was buried in the Quaker Cemetery called "Friends Grove", 3 1/2 miles N.W. of Greenup, Ills. He served as Cpl. in Co. B, 2nd Reg. IL Light Artillery during the Civil War. In the "History of Cumberland County" on page 399, it states that John Franklin Freeman was married to Mary Olive Latta, Oct. 18, 1899 by the Notary Pubic Levi Ross in Toldeo, Ill. Mary Olive was born Oct. 16, 1881 and was the daughter of Thomas Jefferson Latta and Catharine (Fogleman) Latta. Mary Olive's father, Thomas Jefferson Latta, was the son of Thomas Moore and Catherine Latta. He was born in Paris, Stark Co., Ohio Sept. 23, 1839 and died Jan. 12, 1925 and was buried in the Friends Grove Cemetery north of Greenup. He spent the earlier part of his life in Ohio and came with his parents to Ill., April 28 1851. He was an active school teacher before and after the Civil War. Thomas enlisted in the Civil War in 1861 and served as a Sergeant in Co. B. 2nd Regiment, Light Artillery. He was wounded in the Battle of Guntown. He was run over by a heavy artillery wagon and left lying on the battlefield until a comrade came along and picked him up. In the battle of Shiloh, he rode a little white pony one hundred and fifty miles in the retreat under General Grant. He also served under General Rosecrane and Sturgess. Thomas' grandfather was a Captain in the Revolutionary War and was killed in the Battle of Brandywine. His father was a Captain in the War of 1812. Thomas' mother was lost in Napoleon's March from France to Moscow, Russia. Thomas Jefferson married Catherie Fogleman Nov. 27, 1870 by Rev. N. C. Green in Prairie City (now Toledo) Cumberland Co., Ill. They had two children Sarah Elizabeth and Mary Olive. Catherine ws born Jan. 5, 1849. She was the daughter of Anderson and Elizabeth (Bowman) Fogleman. Anderson came to Ill. from S. C. In those days it was believed that some illnesses could be cured by bleeding the patient. Anderson rendered these services. He used a small instrument, called a bleeder. The instrument is now in the possession of Mary Olive's family. Catherine died in 1885 and was buried in a cemetery in Terre Haute, Ind. 14 SARAH ELIZABETH "LIZZIE" (5) m. William Kinkaid; d. in 1932. 15 MARY OLIVE "MAMIE" (5) b. Oct. 16, 1881; m. John Freeman Oct. 18, 1899. Eleven children were born to John Franklin and Mary Olive Freeman. Their names were Thomas Van Buren, Leonora Elizabeth, Elmer Franklin, Luada Catherine, Lawrence Albert, Charles Leslie, Evelyn Eliza, Everett Monroe, Olive Belle, John Kenneth, and Russell Lowell. Thomas M. (3) Thomas J. (2) ____ (1). Born November 1, 1841 in Clark Co., OH; d. February 15, 1940 in Greenup, Cumberland Co., IL at the age of 98; m. Margaret Arthur, daughter of Robert and Catherine (Myers) Arthur. She was born July __, 1847 and died September 1917. He served in the Civil War as a pvt in Co. B of the 2nd Regiment of the Illinois Light Artillery in the Union Army. The "History of Cumberland County" on page 184, lists that John Worley Latta was born at Paris, Ohio on Nov. 1, 1841, came to Illinois in April 1851 and located 3 miles north west of Greenup. Colery broke out in the neighborhood. "My father and mother moved to Marshall in Aug. My mother died Sept 9 same year. My father died 10th of Oct. 1852. A Gardian was put over us children and he bound me out for 3 1/2 years. I ran off and west to Pittsfield, in 1858. I joined the army 28th of July 1861. Was in the Battle of Shilo & Corninth, Miss. April 6 & 7 at Corinth Oct. 4th and 5th 1862. Was in the battle at Brices Cross road June 10, 1864." An application for a military headstone for John W. Latta listed him as a corp. in Co. B, 2nd Reg., IL St. Artillery. Enlisted August 26, 1861 and discharged August 31, 1864. 16 CORA B. (5) b. September 2, 1869; m. Mr. Baumgartner. Lived Preston, Kan.
18 ALBERT H. (5) b. 1873; d. 1884 at 12 years of age and buried at Greenup, Ills. 19 DOTTIE D. (5) b. at Greenup, Ills. September 30, 1873; m. Mr. Luce. Lived at Cunningham, Kan.
20 JOHN HERMAN (5) b. at Greenup, Ill. January 5, 1887. Lived Silver City, N.M. His WWI draft card stated that he was employed as a laborer in the St. Louis Basket and Box Factory, and that he had blue eyes and black hair. John Herman Latta died on May 13, 1949 in Los Angeles, California. "The greater part of the history of Greenup, up to the time it became the county seat of Cumberland, is pretty much the same old oft repeated story, of rough western pioneer villages, such as is so well known to many of the people of the West. From this time forward the village prospered. The national road brought new life with its increasing travel, and it grew to be a noted point to travelers far and near. There is no doubt but Greenup is well remembered by hundreds of persons who were on their way to the golden hills of California, in search of their hidden treasures, whose good fortune it was to partake of the hospitalities of Greenup, on their wearisome journey. Charles Conzet, Sr. is undoubtedly remembered as the landlord of the Greenup House. Doubtless meals obtained from his well loaded table, by the hungry traveler, thirty years ago, have helped to establish that reputation as a landlord which Uncle Charley so justly deserves. He came to this country from Philadelphia in 1848, and located 3 miles east of Greenup, where he pursued the occupation of a farmer for about 5 years. He then bought the Greenup House and entertained the public here for years. Closely connected with this house is a rather laughable anecdote, for an account of which we are under many many obligations to its hero, Mr. J. W. Latta. The incident to which we allude occurred a short time before Mr. Conzet became proprietor of the house, and during the time that Simon Lyons was running it. Mr. Lyons, it seems, was entertaining a temporary boarder, who was at the time a citizen of Missouri. This boarder was projecting a portable photographic office, which was to be carried on wheels. Some short words passed in a little unpleasantness in the bar-room, between the boarder and Mr. Harvey Green, who was then driving stage. Whereupon, Mr. Latta said "no gentleman or Christian will insult me, and a blackguard shall not." At this, Mr. Green informed him that he could not step out upon the porch and say that. Out they went. But when Mr. Harvey saw hands placed upon pistols, in casing pockets, performed a series of back steps, the other the while advancing, until Mr. Lyons cried out "Harvey! Harvey!" Whereupon the latter threw up the sponge and said "now you quit and I will." Of course, his prudence at this juncture was commended. And while joked for his bravery, in apology he said "I didn't know but the d*****d old flint lock might go off." Hence the origin of "flint lock" in this locality." 1860 Cumberland, IL Census, Cottonwood Twp, in the household of John Snodgrass is found John W. Latta, 49, of Ohio, teacher. Cumberland Tribune, Greenup Newspaper, April 30, 1853 - WANTED: Six Thousand rails made immediately. Seventy-five cents per hundred. CASH. J. W. Latta. 1876 - Mr. Latta of Cumberland County recently spent several weeks at the Centennial and pronounced it a "big thing on ice". Newton Press, Oct. 12, 1876. Mr. Latta of Cumberland County, called on us last week. Mr. L. had just returned from a visit to the Platte County, in Missouri. Feb. 17, 1876. Thomas M. (3) Thomas J. (2) ____ (1). Born March 8, 1844 in Stark County, Ohio; d. March 5, 1927 in Charleston, Coles Co., IL; m. 1) Sarah Glasco, and 2) Loretta "Rhetta" _____________. Lived Charleston, IL. Served in Co. H, 59th Illinois Infantry lists: Latta, Albert B., resident of Charleston, recruit, August 23, 1861, mustered out Sept. 17, 1864. Wounded at Battle of Stone River, Tenn. Spent time in hospitals in Nashville, Tenn.
lived at Los Angles, Calif.
32 ROY C. (5) b. May 1873 in Illinois. 33 MARY (5) b. 1878 in Illinois. John W. (4) Thomas M. (3) Thomas J. (2) ____ (1). Born September 19, 1871 at Greenup, Cumberland Co., IL; d. Sept. 23, 1942 at Greenup, his death certificate says that he was born in Wayne Co., Ohio (but that would have been his father); m. Lida Bell Eggers, daughter of William Eggers and Ellen Eggers. Lida died Nov. 10, 1944 in Greenup. 22 HOLLIE HORACE (6) b. May 1893; m. Ada Fairchild in 1931. World war veteran. 23 OLIVA MARIE (6) b. July 9, 1899; m. Paul Nicholas White March 17, 1923. One daughter: Mary Jane b. November 17, 1931. 24 BERTHEL THERIS (6) b. October 25, 1900; m. Everett Oakley. One son, Francis Gene, b. September 2, 1925. Lived at Matteon, Ills. 25 MARGARET ELLEN (6) b. June 17, 1908; d. Oct. 18, 1991; buried in the Jewett Cemetery, Cumberland Co., IL. (the cemetery is located 1 mile west of the town of Jewett on the north side of old Route 40 in Woodbury Township) m. Harold Nicholas Beals in August of 1928. He was born Jan. 19, 1905 and died April 25, 1989. One daughter: Agnes Joan b. May 1930. 26 SERINA LORENE (6) b. December 1914 (according to 1920 census, she was a twin to Agnes); d. Dec. 6, 1953; buried in the Greenup Cemetery; m. Walter Carl Benson in October 1930. Children: Paul, Carl, Jack and James. 27 LORA AGNESS (6) b. 1914; m. Norman Wayne Perisho. He was born Nov. 7, 1913. They owned and operated Perisho Jewelry Store in Greenup, IL. Wayne was the son of Sylvester and Ada (Short) Perisho. 28 ALBERT GLENDON (6) b. October 1915; d. 1981; m. Mrs. Lang, a widow with three children. Robert A (5) John W. (4) Thomas M. (3) Thomas J. (2) ____ (1). Born September 22, 1906; d. Oct., 1983 in Greenup, Cumberland Co., IL; m. Lorena Legg December 25, 1928. She was born Oct. 24, 1807 and died Oct. 27, 1998. 29 THEODORE RICHARD (7) b. July 22, 1930. 35 EARLENE (7) b. July 22, 1930, died after 1940. John Worley (4) Thomas M. (3) Thomas J. (2) ____ (1). b. at Greenup, Ill. January 5, 1887. Lived Silver City, N.M. His WWI draft card stated that he was employed as a laborer in the St. Louis Basket and Box Factory, and that he had blue eyes and black hair. John Herman Latta died on May 13, 1949 in Los Angeles, California. Herman Latta lived in the Veterans Home in Sawtelle, California. He was admitted October 26, 1930, at the age of 43. His disabilities were listed as chronic constipation, internal hemmorhoids, and neurasthenia. His records stated that he served in the medical corp as a pvt, and that he enlisted August 28, 1916 at Ft. Logan, CO. He listed his nearest relative as Robert Latta, Toledo, IL. He is found listed in two different census' in 1910, once in IL, and then in Texas. He probably moved during that year from Illinois to Texas. Robert Andrew (5) John W. (4) Thomas M. (3) Thomas J. (2) ____ (1). b. Dec. 27, 1903 in IL; d. Sept 2, 1969 (death certificate says 1969, although his wife's obituary says differently) in Clarksburg, Harrison Co., WV. m. Flo Ann Wilson. Buried in the Lost Creek Baptist Church Cemetery, Lost Creek, Harrison Co., WV. March 27, 1913, in Bradford, Arkansas. She was the daughter of the late Talbert John Wilson and Flo Edna Goff Wilson. She was married to the late John W.
Department Ladies Auxiliary and the Lost Creek Friendly Homemakers. At the request of Mrs. Latta, she will be cremated and there will be no public visitation. Adventist Cemetery at Lost Creek Brick Church Cemetery. 36 JOHN FLOYD (7) b. August 4, 1935; d. Oct. 5, 2012 in Stuart, Florida. 37 AGNES RUTH (7) b. 1938; m. Loren Keith Glover in Harrison Co., WV on Dec. 15, 1956; also m. _____ Blackwell. John William (6) Robert Andrew (5) John W. (4) Thomas M. (3) Thomas J. (2) ____ (1). b. August 4, 1935; d. Oct. 5, 2012 in Stuart, Florida. m. Elva Mae Harrison on Sept. 27, 1958 in Harrison Co., WV; also m. Joyce McComas. John Floyd Latta, 77, of Stuart, FL died Oct. 5, 2012 at Treasure Coast Hospice. Born in Bradford, AR, he lived in Stuart for 30 years, coming from West Virginia. He was a veteran of the United States Army, serving as a military policeman at Fort Myer, VA. Before retirement, he was vice president in dealer relationships for General Motors in Washington DC. After he moved to Stuart, he was vice president in charge of dealership relations for Barnett Bank in Port St. Lucie, FL. John was a member of First United Methodist Church, Stuart. Survivors include his wife of 30 years, Joyce McComas Latta of Stuart; sons, John Todd Latta of Berryville, VA and James Dallas Latta of Craigsville, VA; daughters, Rebecca Chapman of Coalgate, OK and Robin Lynn Grey of Myrtle Beach, SC; stepdaughters, Jennifer Lynn Towell of Stuart and Carla Leigh Colombo of Blairsville, GA; sister, Agnes Ruth Blackwell of Charlotte, NC; eight grandchildren; and two great-grandchildren. He was preceded in death by his parents, John and Flo Ann Wilson. An inurnment service will begin at 5 p.m. Oct. 17 at Fernhill Memorial Gardens in Stuart, with Pastor Philip Short officiating. Memorial contributions in Mr. Latta's honor may be made to Treasure Coast Hospice, 1201 SE Indian St., Stuart, FL 34997, (772) 403-4506. Arrangements are entrusted to Martin Funeral Home & Crematory, Stuart Chapel.